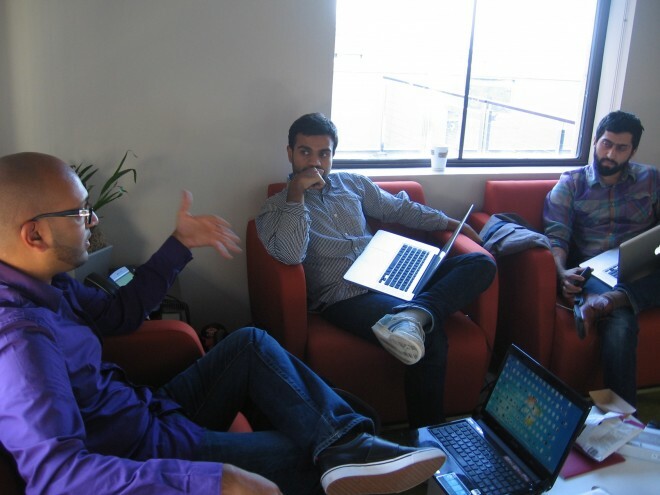 Aman Ali, Bassam Tariq, and filmmaker Musa Syeed discuss a web strategy for their documentary during a hack day at Mozilla's office in San Francisco. SAN FRANCISCO — Filmmakers and coders hunkered down for two days of creative collaboration here during a first-of-its-kind hackathon that explored the future of web video — specifically Popcorn.js, Mozilla’s HTML5 media toolkit designed to amp up interactivity. On one such team: Steve James, the acclaimed director of Hoop Dreams, who brought his raw new documentary The Interrupters, about former gang members and ex-cons who try to stop violence in their neighborhoods. During the two-day event at Mozilla’s new digs in the Hills Bros. Coffee building, James worked with coder Rick Waldron and Anton Seals Jr., a Chicago community organizer who conceived of the interactive experience they’re building to augment the film. Such nontraditional working groups are part and parcel of the Living Docs Project, a joint initiative from Mozilla and the Independent Television Service that offers a glimpse of how filmmakers could harness the internet to expand their creations in unforeseen ways. Popcorn.js, which few outside the web-development world have ever heard of, could be the next big thing in internet video. It’s a simple — for coders, at least — framework that allows filmmakers to supplement their movies with news feeds, Twitter posts, informational windows or even other videos, which show up picture-in-picture style. For example, if a subject in a film mentions a place, a link can pop up within the video or alongside it, directing the viewer to a Google Map of the location. Popcorn-powered videos work in any HTML5-compatible browser and are easy to navigate for anyone who has ever used the internet. The tools the Popcorn coders are creating could lead to far more interactive online experiences, not just for movies and documentaries but for all videos. Want to make a cat video replete with recent updates from Fluffy’s Facebook page and all the latest tweets tagged #cats? There could soon be an app for that. It’s an ambitious goal, not unlike asking filmmakers to hunker down with coders they’ve never met to crank out new web concepts for film in 15 hours, which all six teams did. So there must be something to be said for the simplicity aspect of Popcorn that Waldron mentioned. It’s easy to envision Popcorn helping filmmakers with their productions as well as creating communities for films after their release. At least one documentary project, One Millionth Tower, has already made use of the tools, coupling Popcorn with 3-D graphics generator WebGL to create a web-ready documentary that shows what would happen if the residents of a Toronto highrise were allowed to participate in re-creating their home tower. Another film at the hack day, 18 Days in Egypt, created a site that pulled in Flickr photos, newsfeeds and other data from around the web (see the 18 Days prototype from the hack day). The revolution in Egypt that ousted President Hosni Mubarak in February has died down, but if the filmmakers tool had been live as events were unfolding, it could have functioned as a massive media-collection tool (and can now be used to follow the events in Egypt as they continue to unfold). Popcorn’s toolkit could also be used to build related mini-documentaries after filming has wrapped on a feature — or even long after the original film has left theaters. Aman Ali and Bassam Tariq, the creators and subjects of 30 Mosques, wanted their web experience to help people re-create and share in the trips they took to break the fast in a different mosque for each of the 30 days of Ramadan. Their first journey in 2009 was just around New York and captured on Tumblr; the second was a cross-country trip that they blogged; and the third journey was a transcontinental trek captured by their filmmaker friend Musa Syeed. It could make video-watching and movie fandom a far less passive experience. After noticing that their journey had inspired copycats the world over, they decided their website would serve as a tool people could use to share Ramadan stories for the next holy month (so they could spend Ramadan at home next year). Their coder, Bobby Richter, is building a site where people can upload a video of themselves doing something related to specific themes during the holy month or based on challenges that they suggest. Those videos would then populate a timeline for each day of the month (see the 30 Mosques Popcorn prototype). Tariq, jittery with excitement after a day and half of creating, said he likes the idea of allowing people to tag videos they upload so the clips can be collected into themed collages.